The world revolves around deadlines. Some are moveable. Like Brexit. Others aren’t. Like the tax year. On the latter at least, the end really is nigh (today to be exact). And that means a fresh set of tax and benefit changes to contend with come this weekend. As part of our commitment to offering cut price financial advice* we’ve had a Smörgåsbord of updates this week on what’s going on, from a look at Child Benefit (which turned 40 on Tuesday and is going through something of a mid-life crisis) to a deep dive into pension saving auto-enrolment (which is still a toddler but looking decidedly more perky as it ramps up again). Stepping back from the individual chops and changes, it’s also underappreciated how much the coming year will bring the curtain down on the era of post-financial crisis austerity. At some point we’ll all get round to deciding what replaces it…. *we don’t provide financial advice, are not regulated by anyone and remind you that your capital living standards can go down as well as up if we keep stuffing the country up. Decade of debt. The pop history of the financial crisis is that too much debt was the root cause. In its immediate aftermath politicians of all stripes, creeds and countries said the job was to get debt down. Deleveraging was meant to be the post-crisis order of the day. How’s that gone? Not so well is the answer from an interesting Bloomberg article. Western banks and US consumers have cut their debts, but governments, companies and students have piled it on. But while there is lots of (in our view overdone) angsting about UK consumer debt right now, where has the real post-crisis binge taken place? China, with its private(ish) sector accounting for 70 per cent of all new world debt since the crisis. Profits up. The IMF’s journey from being the neoliberal vanguard to let-it-all-hang-out lefties continues this week. In a chapter of their World Economic Outlook (decent summary) they argue that 1) corporate profits have increased in recent years in advanced economies 2) that it’s the most advanced firms being able to increase mark-ups, with no increase for the rest 3) that this is bad for growth and workers. The capitalist puppet masters must worry if anyone’s got their backs these days. Mobility down. In recent weeks we’ve looked at the trials and tribulations of the top 1 per cent. Now, with great power wealth comes great responsibility. This means rich parents increasingly feel the financial pressure to do what it takes to help their kids succeed – and most evidence shows they generally manage it. A long read from James Kirkup this week focuses on the difficulty this creates for everyone saying they love a bit of social mobility – for some to go up, others have to go down. The reason this matters so much today is that in an era of low growth, families are likely to fight tooth and nail to avoid downward relative mobility for their children. Why? Because it is much more likely to lead to downward absolute mobility, where the kids actually have a lower standard of living than their parents. Low growth kills the politics of genuine social mobility – which is another reason to try and get us out of it. New banking? It’s been ten years since the global financial crisis and UK banks still have low levels of public trust. This doesn’t mean that Brits don’t want a local bank, even though they’ve stopped going into them as much. You can see the politics then in John McDonnell’s proposal to transform post offices into branches of a new nationalised bank. But just to prove there’s nothing new under the sun, have a guess who previously promised “we will transform the Post Office into a People’s Bank”. Yep, Gordon Brown in Labour’s 2010 manifesto. A common (and correct) critique of ongoing Brexit shenanigans is that it’s taking up all our political bandwidth, leaving a huge pile of important questions on the mountainous to-do list. But there have been signs that the tectonic plates of policy are shifting when it comes to tackling our housing crisis. 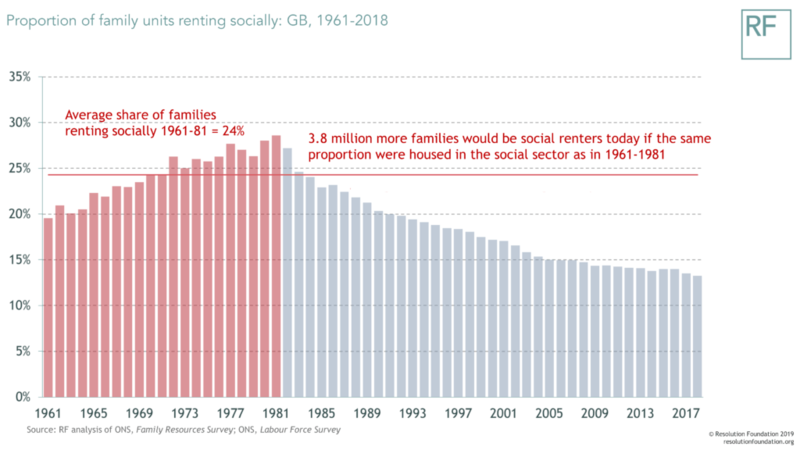 Falling home ownership and the shrinking social housing sector has led to the rapid rise of private rented accommodation – 1 in 5 new-borns’ first home is in the private rented sector today, compared to just 1 in 14 in 1996. This has already led to big policy change on the ownership front with the likes of Help to Buy. But will it feed through to a change of direction on social housing? That might mean reversing the near 30 year trend of fewer and fewer of us living in the sector, as this week’s chart shows. We’ll be focusing on the future role of social housing in an event and series of blogs over the course of next week.